Kids will have fun making this Puffy Paint PB&J craft as a fun way to celebrate kid’s favorite sandwich, back to school, and national Peanut Butter and Jelly Day! My kids LOVE peanut butter and jelly. We don’t have peanut allergies in our home, so we’re able to eat the classic sandwich whenever we like. My kids insist on either grape jelly or strawberry jam for their PB&J sandwiches. 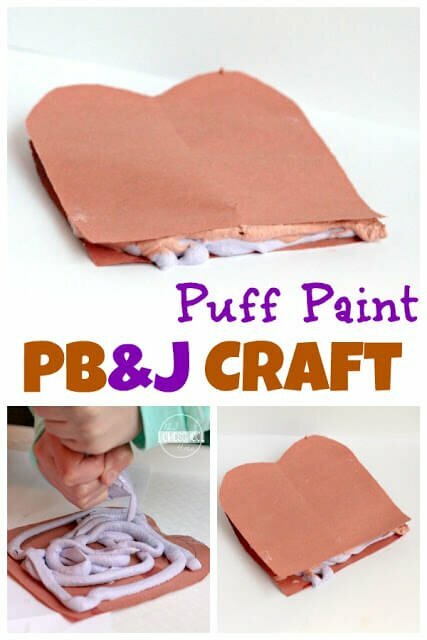 Even if you have peanut allergies, you can enjoy this adorable puff paint peanut butter and jelly craft. 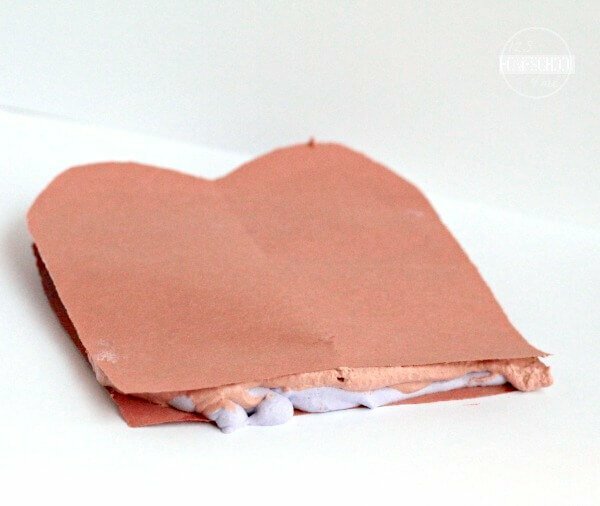 My kids LOVED putting together this craft, because it felt like making a real sandwich! Kids will love making their very own play peanut butter and jelly sandwiches! First, fold one of your sheets of paper (or foam) in half. 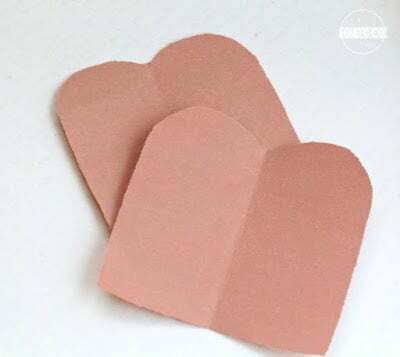 Along the fold, draw half of a piece of bread and cut out. Repeat for the other piece of paper. 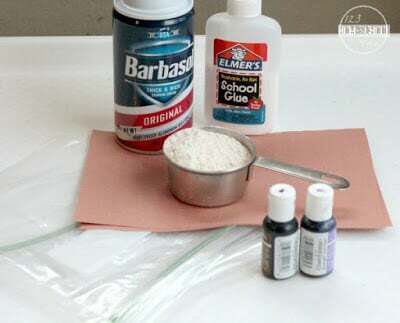 In each baggie, mix 1/4 of a cup of flour, 1/4 of a cup of glue, and 3/4 of a cup of shaving cream. Add 3-5 drops of food coloring to each bag (add purple to one and brown to the other). Seal the bags up tightly. Mix the ingredients together until the bag turns a consistent color. This took us about two minutes. Cut a tiny corner off one end of the bag. We put our jelly on one and peanut butter on the other. Stack the two sides of the sandwich together. At this point, you have two options. You can let the puff paint dry, and use the sandwich as a prop for dolls or cooking in a play kitchen. 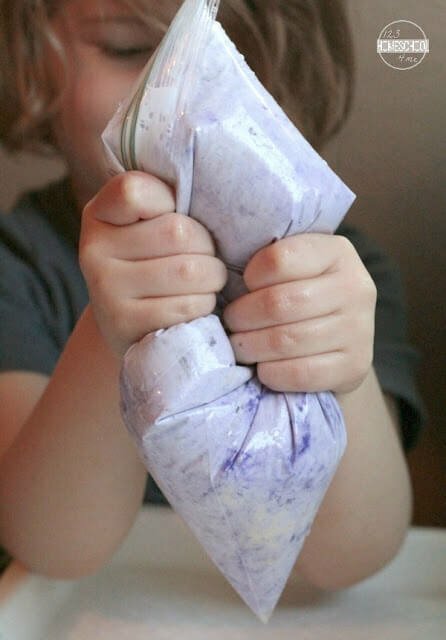 You can also squeeze the excess peanut butter and jelly out for gooey, sensory play. My preschooler chose to squeeze out her peanut butter and jelly, while my older daughter decided to save hers for later. Let the puff paint dry for about 72 hours before playing with your sandwiches. 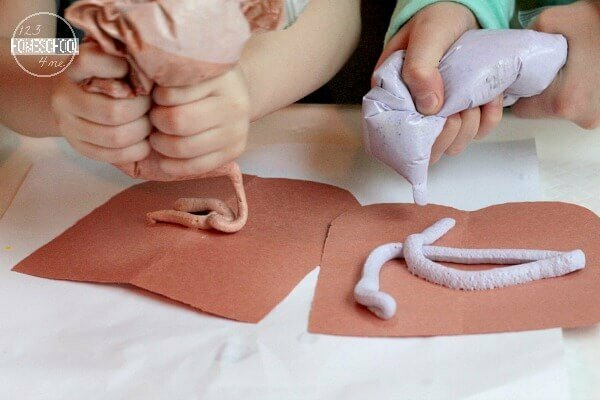 Make sure the puff paint is completely dry before giving it to a child to play with.